Get your case started quickly by paying online, right now. This expedites your case, designates Mr. Baggett to you, and gives you priority attention in our office. All the buttons on this page are utilized to pay for services of Bart Baggett. Initial review and consultation can be as low as $400. The typical on questioned document case is $995 flat rate. The more complicated cases which include multiple Questioned documents, multiple suspects, or specific advanced forensic tests will be higher. Each Additional Questioned Document or Suspect Document using the Flat Rate Option. Court RSVP Deposit (Must accompany signed Court RSVP form). If you are planning on hiring a document examiner soley based on the a fair price, you are are in luck. Despite Mr. Baggett's deep experience and fame, he has maintained a similar price structure as his graduating students and industry peers so that the clients can choose based on 'quality' and not price. Bart Baggett's rate schedule is in the normal range of document examiners nationwide for testimonial time and court room appearances... the prices listed above for the initial consultation, labwork, and letter of opinion are below the average industry prices. But, Mr. Baggett is not the cheapest in the United States. If you want a "discount price", please contact one of Mr. Baggett's students or a less experienced examiner. Choose your expert based on quality, not price. Full rate schedule can be downloaded here. Download Bart's Current Rate Sheet in PDF format. Full Pricing Policy is published here. of the flat rate pricing per document offer. Full Refund and Chargeback Policy is published here. Bart Baggett has been court qualified and testified in Texas, California, Alaska, and Arizona Courts in cases ranging from the value of a 1974 Pick up truck to the "stock certificate" of a 20 million dollar company. When your case requires the most polished, professional, and articluate expert FDE witness working today, hire Bart Baggett. Download Bart's full CV here. Get your case started by prepaying online, right now. Once retained, Bart Baggett will consult directly with your attorney on all areas of forensic evidence and putting an expert witness on the stand regarding the documents in question. Regardless of the objective "opinion" rendered by Mr. Baggett's lab, Mr. Baggett's experience and advice has helped dozens of attorney's make strategic case decisions which significantly improves the outcome of their case as a whole. Forensic analysis can tell the truth, when clients often do not. Our experts can often help you determine how much weight the documents can carry in your case. This page has an expanded F.A.Q. page which also includes a frequently asked telephone hotline for new clients. Can Bart testify outside of California? Most experts are retired government employees and charge about $1200 as a retainer before they even view the documents and begin the case. Bart and his HSI associates charge under $995 to get started. There is no credible experts that charge $200. If you see a price that low, run the other direction. 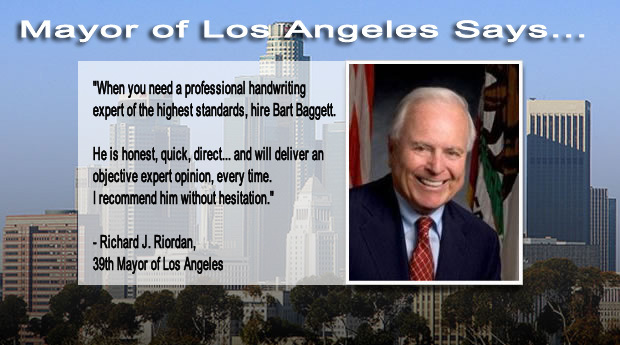 Bart is the arguably the most recognized (famous) handwriting expert working in the USA. If credibility, accuracy, and integrity are important to your case, hire Bart. And, Bart has the rates as associates who have been working less than a year professionally. The only reason not to hire Bart is if your court date is on a date when Bart is already testifying in another case. He can't be two places at once. You have seen him regularly on CNN and the other major new outlets. What training does a handwriting expert have to have in order to testify in a court of law? That is a very long answer. The short answer is that an expert's qualifications are judged by the judge in each case. The long answer is that many working examiners are not qualified and shouldn't be taking cases and we hope you do not hire them. Mr. Baggett is very qualified. My case contains no originals, can you still render an opinion which will hold up in court? Yes. Bart can render an official opinion based on just copies on a regular basis. Will Bart's opinion be accepted in a court of law? Of course, but an expert witness's testimony is never a guarantee the judge will rule in your favor. Documents and handwritten evidence are usually just a small piece of a much larger puzzle. How much will it cost to have Bart Baggett himself come to court and testify in person? Bart's rates are clearly stated on the rate sheet. His court appearance fee is in line with the other experts across the nation. In order for him to come to court, you must have already retained and designated him so he has time to render the authentic opinion. All these questions and more can be answered by simply calling our office. Your first conversation will take place without a fee, so you can make sure you are feel comfortable hiring Mr. Baggett and he is the best expert for your case. Full rates and fees can be seen here. You can also pay online with a credit card at the RATE page.